Posted 1/16/2019 4:26pm by Harland;s Creek Farm. Posted 8/4/2017 5:00pm by Judy Lessler. In my last post, I talked about Tomato Sandwiches and the controversy in NC as to the preferred type of mayonnaise. 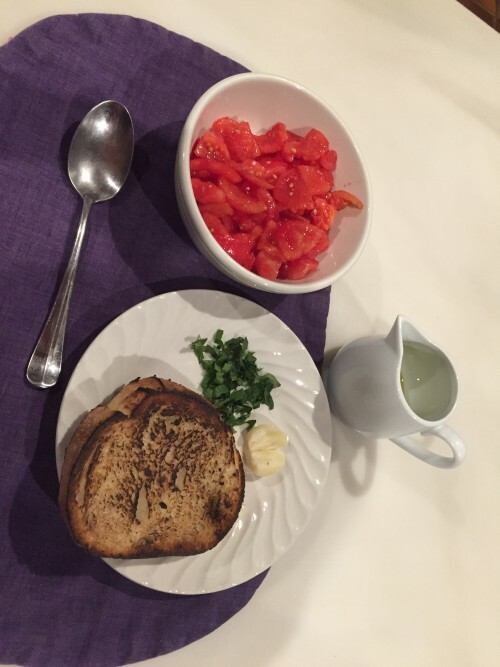 Tomatoes are often served as a topping to traditional Italian bruschetta (or fettunta), which is grilled, stale-bread with olive oil and garlic. My review of numerous articles and recipes has led me to believe this simple dish of grilled bread rubbed with garlic cloves and drizzled with olive oil can engender the passionate differences similar to those surrounding use the of Duke’s or Hellman’s mayo on a tomato sandwich. These differences may have a long history. Famous Italian cookbook writer, Marcella Hazan, is said to have determined bruschetta was likely invented by the ancient Romans. Burscare means to char and, supposedly, the ancient Roman farmers sampled their newly pressed olive oil with bread roasted over coals. Who knew? 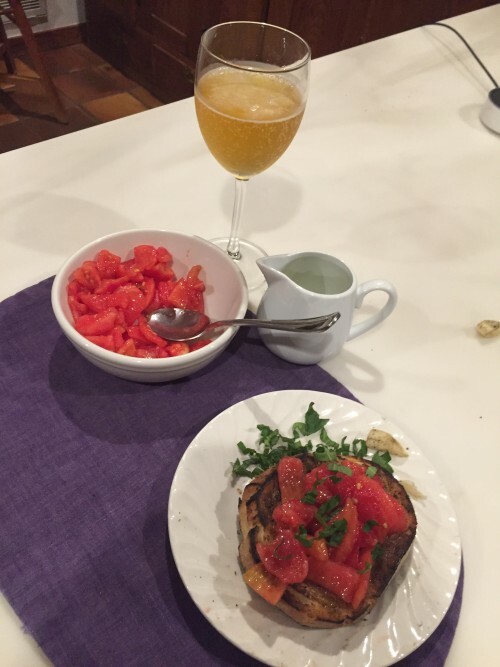 Italians drink wine with their bruschetta, and all embrace the foundational instruction to use, day-old bread, month-old oil, and year-old wine. But then they converge. Some recommend grilling the bread once, others twice but dipping it in a plate of water between the two grillings. Still others espouse using very stale bread and dipping it in water before a single grilling. One writer advises rubbing an entire clove of garlic into a single piece of bread; another to use one clove for four slices of bread. Finally, do you brush or drizzle the olive oil over the bread? Who knows? If you are using a tomato topping, many other issues arise. Do you peel the tomatoes? Must they be seeded? Should they be drained after chopping? Can you mix them with salt, basil, and olive oil to save steps at table? The statistician in me figured out if I tried all the variations recommended in the articles I read, I would need to make 72 different combinations. 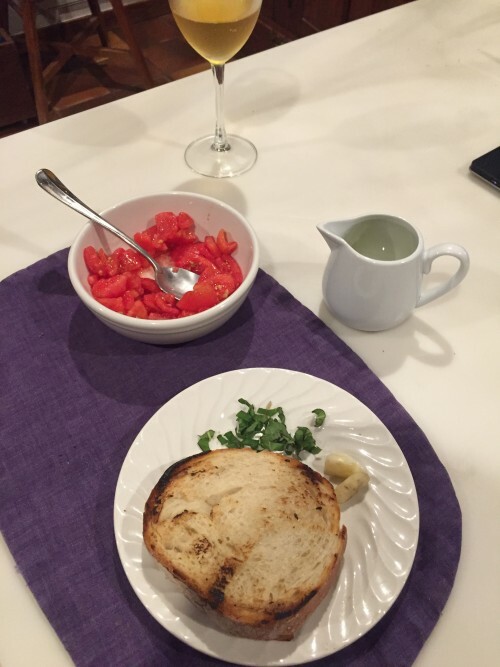 I did not try 72 combinations; however, I did develop my own recipe for Italian Bruschetta with Tomatoes, which I distilled from these readings (and some years of experience). It is given below. I did try three different ways of charring the bread. I was suspicious of Marcella Hanzan’s statements attributing the origin of bruschetta to Ancient Romans. Now I believe her. 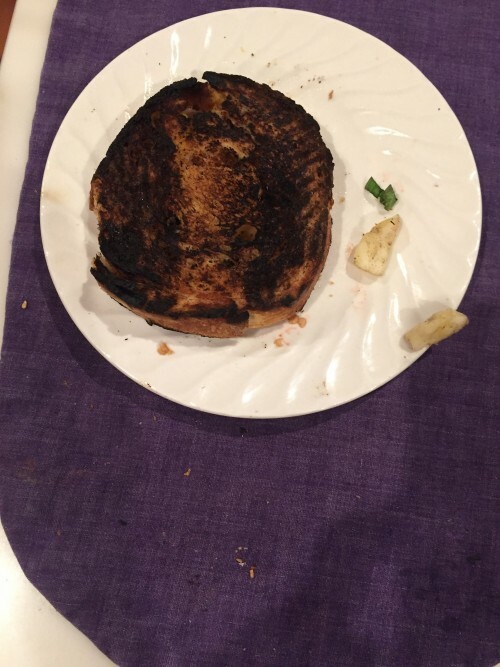 My three versions were: flamed charred bread, dark pan-grilled bread, and light pan-grilled bread. The two with black char on them were definitely the best. I was surprised! Dip tomatoes in boiling water to loosen peels. 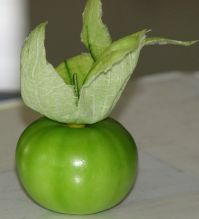 Cool quickly, peel, split, remove most of the seeds, and chop into half-inch pieces. Drain in a colander, place in a bowl, and add salt to taste. Peel and gently crack the garlic with the side of a knife or a garlic press. You want the garlic to remain nearly whole. Grill bread over charcoal, on a gas grill, under a broiler, or on the stove. Rub one clover garlic into onto each slice of bread. Drizzle with olive oil. Top with tomato mixture. Sprinkle with basil cut into thin ribbons if desired. PEELING THE TOMATOES IS ESSENTIAL. Posted 7/25/2017 11:18am by Judy Lessler. It is tomato sandwich time. 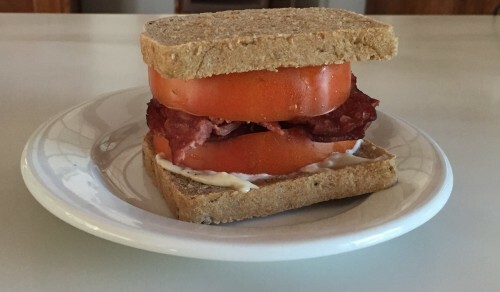 The picture is a tomato sandwich with turkey bacon. It just needs the last preparation step. It has to be smashed. After taking the photo, I pressed down hard on one side, turned it over, and pressed hard on the other. This causes the juices to penetrate the bread, and if you do a good job, you may need a bib to eat it. Here’s the scoop on tomato sandwiches: The classic tomato sandwich is simply tomato and mayonnaise on white bread. In assessing quality, people could debate the variety of tomato, the type of bread, and the appropriateness of additives, such as basil, dill, or a cucumber. These ingredients do not inspire much passion at least not the passion the type of mayonnaise does. Should you use Hellman’s or Duke’s? In the mid-twentieth century when I was growing up, some people were known to use Miracle Whip instead of mayo. This has since been recognized as a colossal mistake, and since the dawning of the twenty-first century, it is rare to find a Miracle Whip proponent. Curiously, Miracle Whip has become very popular in Germany, which a strange development given that Angela Merkel is now the leader of the free world, and you would expect that Germans, in general, would be upholding high standards of decorum and manners as benefits their new leadership status. I learned about the popularity of Miracle Whip in Germany from Wikipedia, and, upon consideration, think it may be OK. Wiki did not mention how the Germans were eating Miracle Whip. Perhaps it is not on tomato sandwiches and does not represent a desecration of culinary standards. You do not need to search far to find articles and “research” on the Duke’s versus Hellman’s conflict. In 2015, Our State magazine published an article by Susan Strafford Kelly called Mayo Mutiny about this conflict. Kelly reports interest in resolving this conflict is now so widespread and intense that people are conducting their own blind studies and posting the results on social media. She also noted a general preference for Duke’s mayonnaise. Only 18 months later, Kathleen Purvis reported in the Charlotte Observer on the results of a small experiment conducted by the Piedmont Culinary Guild with chefs and farmer. This created an uproar among Duke’s proponents because Hellmann’s won. I worked for thirty-years as a research statistician. I can confidently state that these small scale experiments are flawed in terms of sample size, randomness, and control of extraneous variables. Therefore, just go with your own preferences, but remember to keep the Duke’s on hand to make a sandwich for your visiting aunt. Posted 2/1/2017 10:22am by Judy Lessler. The following quote from the Food and Agricultural Organization of the United Nations says it all: “…organic [methods] …are increasing soil organic carbon by [transferring] large amounts of CO2 from the atmosphere to the soil … enhanced carbon sequestration, coupled with additional biodiversity…makes organic agriculture [has] potential for mitigating and adapting to climate change. From http://www.fao.org/organicag/oa-specialfeatures/oa-climatechange/en/ January 29, 2017. We are doing our part to save the earth. Posted 11/11/2016 8:41pm by Judy Lessler. The American Red Cedar is the traditional NC Christmas tree. When I was growing up, every family went out and cut one down for Christmas. 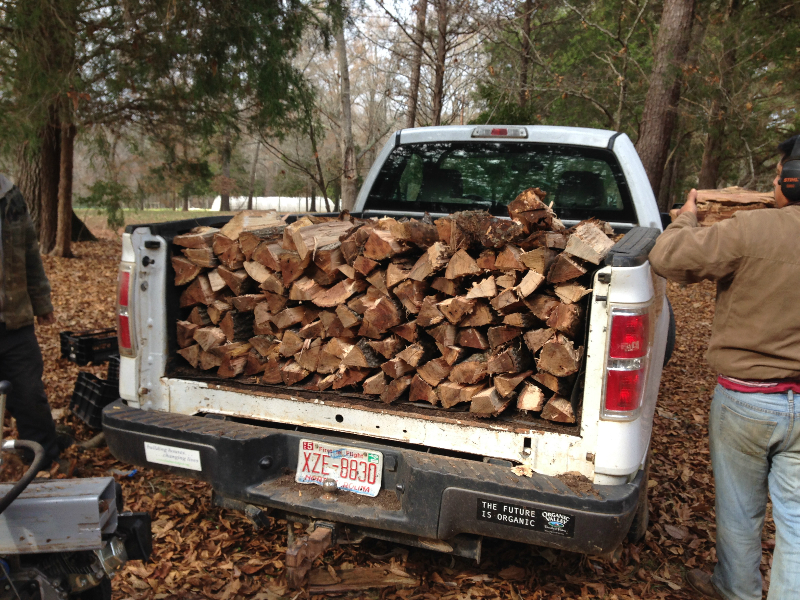 Harland's Creek Farm will be delivering Christmas trees at the Saturday Market in December. 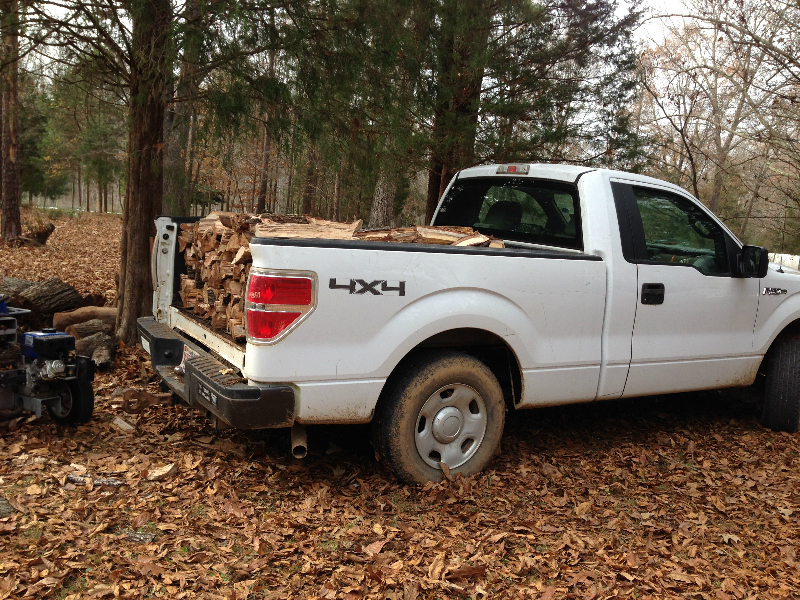 Trees will be cut on Friday for delivery on the following Saturday. We will be taking orders starting on November 11, 2016.Come by,look at a sample, and place your order. Price is $25.00 per tree. Posted 4/29/2016 9:22am by Judy Lessler. Farm News: The big news of 2016 is that HCF is now an LLC with multiple partners, Judy Lessler, Erasmo Flores, and Rene Rios. Rene’s wife, Clementine, and Erasmo’s wife, Yoli, are also working on the farm. It is wonderful to have other women on the farm. 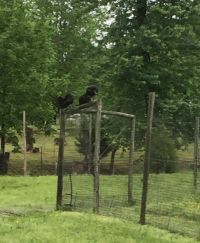 Below is a picture of the three HCF women in front of the salad mix patch; Yoli, Judy, and Clementine in that order. It has been a good year for planting, and we have lots and lots of greens in the field. Look forward to a bounty during the next 6 weeks. We have also started the summer plantings. Tomatoes, beans, and cucumbers are already in the ground. Our potatoes got frozen back three weeks ago; however, they are now growing well.